If you ask Naoko Okusa how to dress your best, she will tell you to look inside yourself before you stare into your overcrowded closet or oversized mirror. Arguably the most influential fashion stylist in Japan, Okusa, who has 136,000 followers on Instagram, offers tried-and-true tips for women who are stuck in a style rut. She helps them discover — or rediscover — the joy of dressing up by helping them experiment different stylistic affiliations while staying true to their essence. “The way you dress and the way you live are two sides of the same coin. They can’t be disconnected,” Okusa, 45, says. “It’s not the amount of clothes you own. It’s how well you know yourself that allows you to wear what makes you feel and look like the best version of yourself,” she says. Okusa says if you’re relying on designer tags to make your style and people see the Hermes Birkin bag holding you and not vice versa, it’s a sign that you have yet to learn the language of fashion. What seems like a dream job happened by chance. After transitioning from the fashion magazine editor’s desk to the life of a freelancer, Okusa was doing everything herself. Okusa knows fashion. She pursues it, and she breathes it. Not only does she hand-select clothing and accessories worn by models at photo shoots, she has exclusive contracts with retailers as their fashion consultant and is a best-selling author and speaker. She’s not one to tell you to camouflage your body flaws with draped sleeves or flared pants. Rather, she would remind you that a well-maintained physique is the foundation of dressing well and tell you to hit the gym. “Fashion is about you, but dressing well equates to good manners. It’s about making others feel good too,” she says. Okusa says she used to alter the way she dresses to please her boyfriends, but when she met her Venezuelan partner and current husband after a failed first marriage she found a sense of security that soon reflected in her clothing choices. There was an off-track phase post divorce, she says. At that time she needed to wear bright, vivid colors to make herself believe she was happy. She looks back on the few photos she has from those days and sees a lost girl trying hard to conceal her emotions. Okusa says she has learned that “dressing your age” is not necessarily negative. She wants middle-aged women know that just because they are now choosing from a small selection of clothes doesn’t mean they are less attractive. On the contrary, Okusa says, it means less stress, less distraction, less expense, and more peace. “Age helped me declutter my wardrobe. Age helped me get rid of the things I don’t need. It made my fashion options narrower and deeper,” she says. But that’s a question that requires one-on-one counseling, Okusa says. She says she would need to know your background, your budget, your closet content, how you want to feel and who you want to be. She suggests finding a brutally honest friend or a critical family member whom you can turn to for fashion advice, but better yet, she says you can always train yourself to stand back and look at yourself objectively. It takes practice to dress well, and it’s a lifelong learning curve. One thing the fashionista strongly recommends is getting others to take photos of you. “Not the ‘say cheese’ kind of photos, but ones that capture unexpected moments,” she says. Knowing your facial features and posture is a start. Okusa has always dared to be different and original, and can’t think of a fashion icon she idolized growing up. If not from people, where does she get her fashion inspiration? “There’s not a fashion blogger or Instagrammer I follow. Fashion is such a big part of my life already, I feel like I get enough. So I look elsewhere,” she says. If she had to name one person that influenced her fashion choices, Okusa says it would have to be her mother. She never wore anything expensive but never seemed to have a style dilemma either. 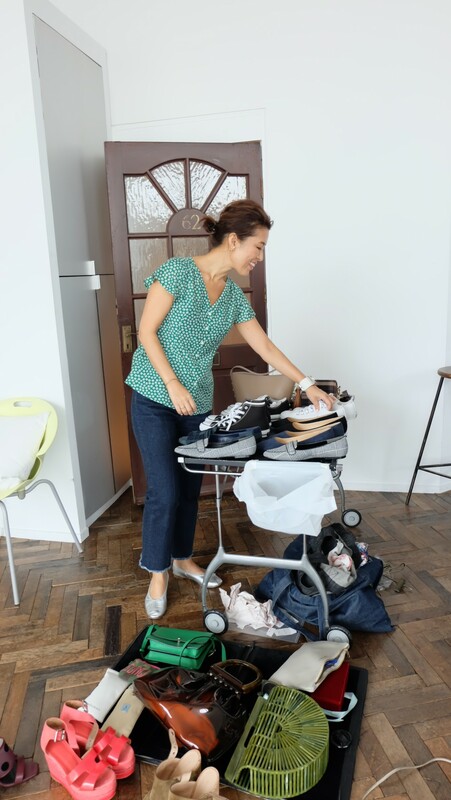 Okusa says she chooses not to drop serious cash on high-end designer clothes for her three children, but she and her husband do their best to teach them fashion etiquette. “I want to spend money on myself so I’m not buying expensive clothes for my kids. But fashion can be a communication tool if you shop together or talk about what to wear on what occasion,” says Okusa, who has two daughters and one son. With her latest book — her 13th — published in April, Okusa says she is enjoying a career landed by accident but led by passion, and the longer she works, the more she realizes she is doing a lot more than helping women create the perfect wardrobe. “The great thing about my job is that I get to relive a person’s life story. I get to learn about their past and get a glimpse of their future. Sometimes I feel more like a therapist than a fashion advisor,” Okusa says.